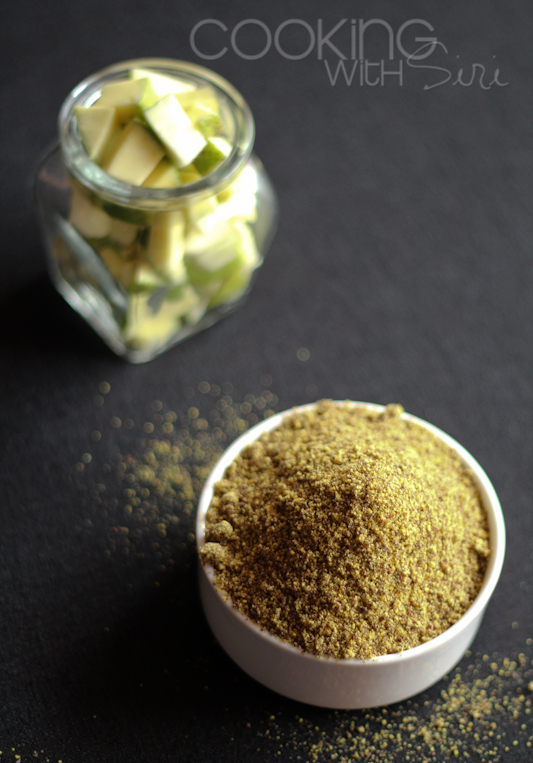 Amma's recipes is a column on this blog, which is very close to my heart. These are the recipes which my mother perfected over many many years and reflects how awesome a cook she is. It is also fun to just photograph once in a while, without thinking about what and how to make a recipe, worrying whether it would turn out well or not. She Cooks, I Photograph. That is the deal. :-) If you guys have any question, do drop in a line or comment on this post. My mom will be more than happy to answer all of them. 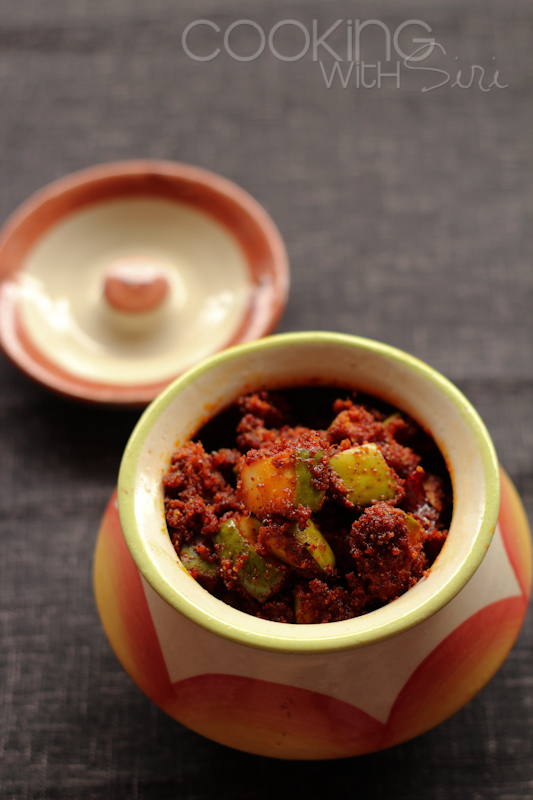 With much less effort, one can make this version of mango pickle, in a giffy! I read it in an article recently - "Food is part of a continuum, changing yet connected to the past." So true. Isn't it? Pickles and chutneys likewise form an integral part of Indian cuisine, especially for us, who live in the southern part of India. These make a amazing accompaniment making our day-to-day meals memorable with their spicy, tangy flavors. 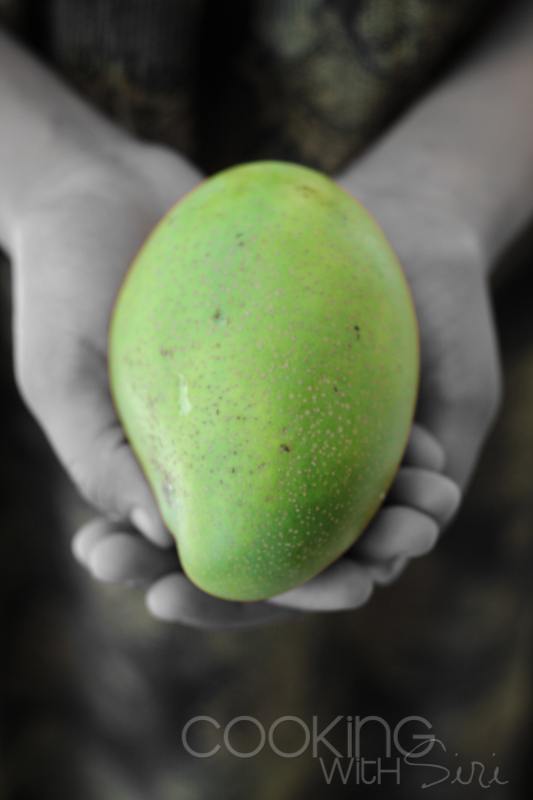 Each one may have his/her absolute favorites and I bet for most of them its "Mango pickle". 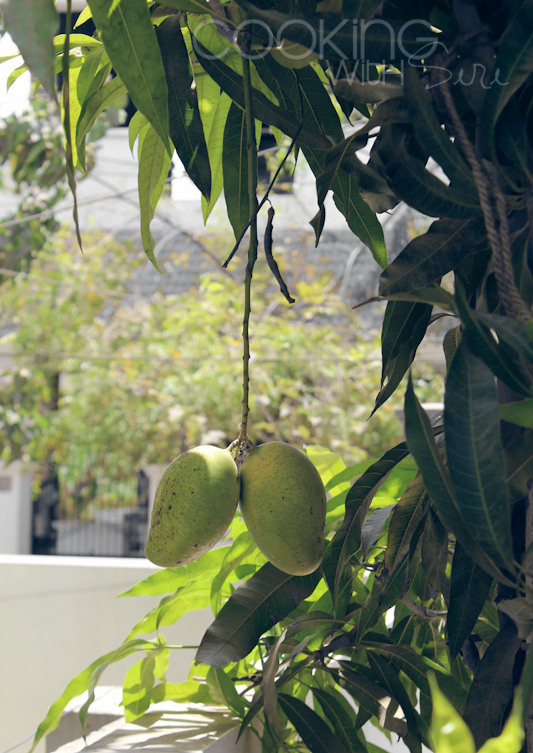 Our first produce - home grown mangoes. Nothing tastes better than these! 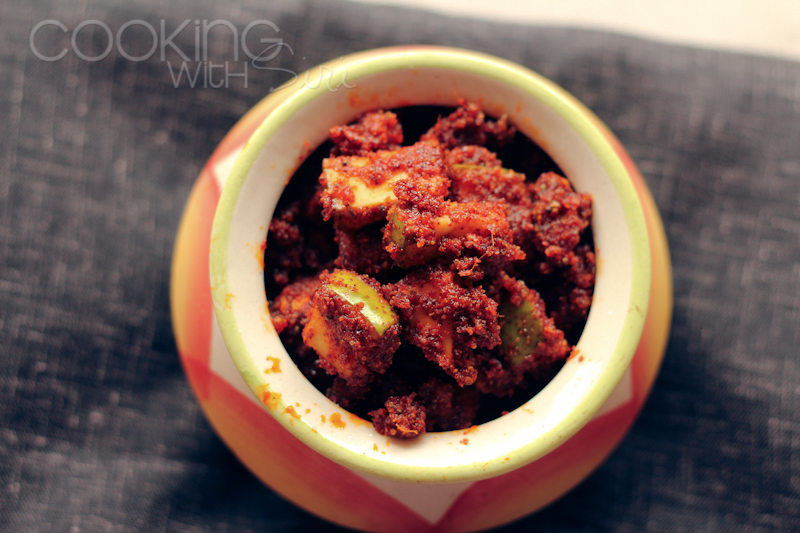 The original Mango pickle is a tad bit laborious, but this version is quick and easy. 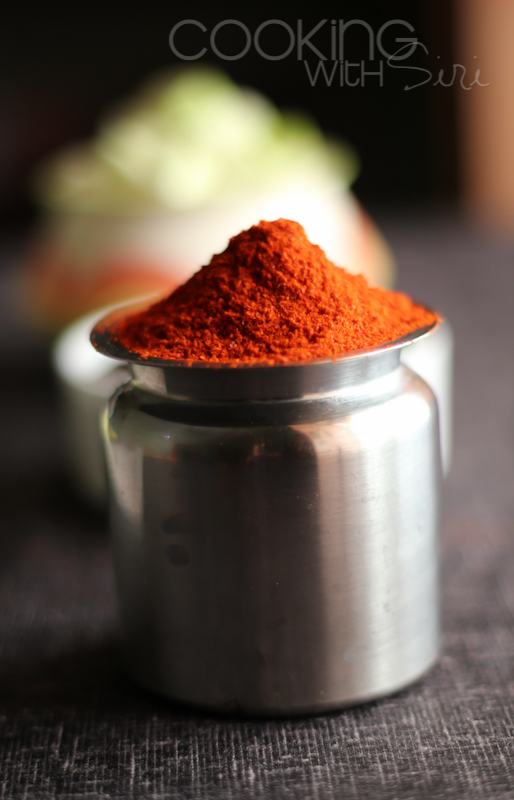 All you need is raw mangoes and spices such as mustard powder, chilli powder, fenugreek-cumin powder, turmeric, salt and oil. Give it a try and am sure you will love it too, as much as we did! Raw mango cubes, ready to be dressed up into the spices! 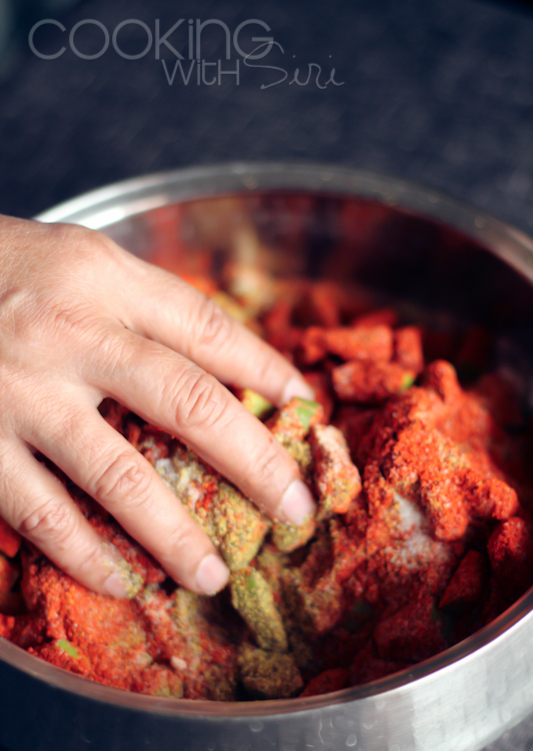 Use the best chilli powder available as its a key ingredient which lends a vibrant red color to the pickle. Spicy, tangy Instant Mango Pickle ready! tastes best after 2-3 days. ..couldn't wait for that long, so quickly mixed with some white rice and devoured till my hearts content! Darn! my mouth is still watering. 1. In a pan, warm 2 cups of oil. 2. In a large bowl (make sure it is bone dry) mix with (dry) hand or a spatula - raw mangoes, chilli powder, mustard powder, turmeric, salt, methi-cumin powder and warm oil. 3. Heat 1 tbsp of oil in a wok and add the tadka ingredients one by one. Let them splutter. Turn off the heat and then add ginger-garlic paste. Add to the mango pickle mixture. Mix well. 4. Next day, Mix the contents once. Warm another cup of oil and add to the mango pickle mixture. Mix again. 1. Don't refrigerate the pickle immediately. Water is released out of mangoes for next 3-4 days and the color will change to a shade of bright red.. Keep mixing the pickle atleast twice a day during this time. Store in an air tight container on Day Five and then refrigerate. 2. When refrigerated, this pickle will stay fresh for 1 month. It is GORGEOUS!! Beautiful Pictures and what a wonderful way to share recipes..,right from the best source.. MOM! 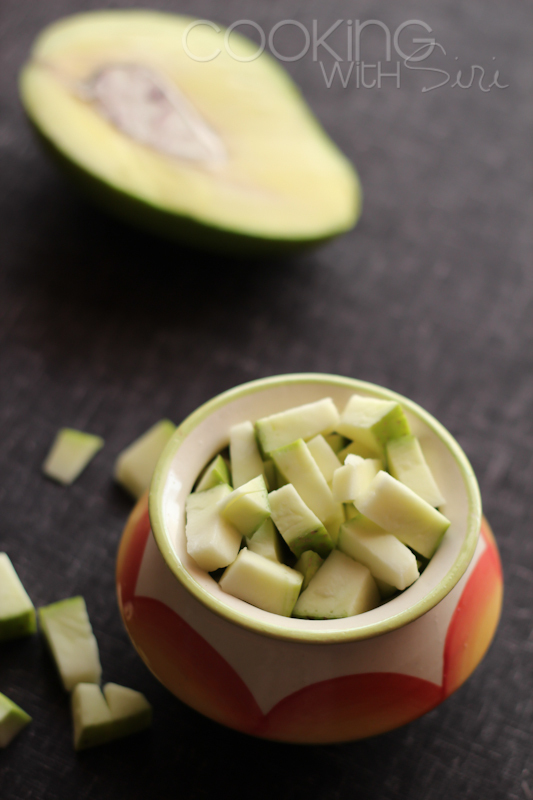 Lovely color and quick recipe, luv the clicks! I am making the pickle for pickle rice. 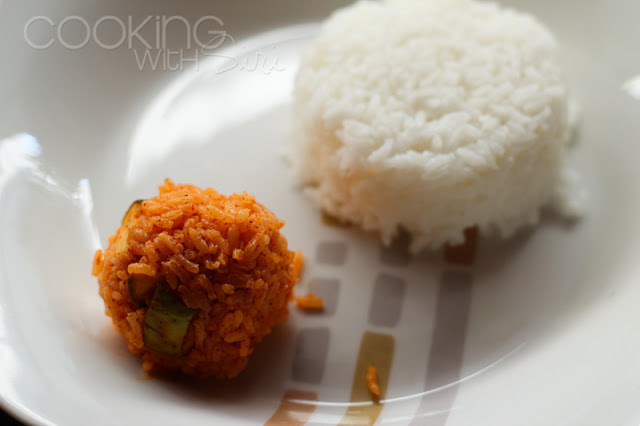 Drooling and drooling here at the sight of the pickle nad rice. Mouthwatering pickle. Loved those pics too.. I came to this blog somehow. Haven't gone thru the recipe yet, and rest of the blog posts, but could not wait to comment on your last pic.. Simply superb! OMG. You totally killed me with the last pic. Am now going to have Avakaya+White Rice for dinner!